Anxiety disorders affect more than 40 million Americans on average. They are defined as a psychological state that is characterized by the intensified and persistent feeling of worry, tension, and nervousness. Anxiety is usually irrational, and occurs even when there is nothing to provoke these feelings. Everyone experiences nervous feelings occasionally - this is a natural survival instinct that helps an individual remain aware of their surroundings - but the nervousness usually subsides after a few minutes. There are several different types of anxiety disorders, such as generalized anxiety disorder, panic disorder, and obsessive compulsive disorder. Anxiety is twice as common in women as it is in men, largely due to hormone fluctuations. In fact, hormone fluctuations are the primary cause of anxiety in menopausal women. During the menopause transition, a woman's estrogen levels rise and fall, and then stay consistently low. When a woman's estrogen levels drop, she becomes more susceptible to anxiety because estrogen significantly affects the brain's regulation of moods and emotions. Additional causes of menopausal anxiety are lack of sleep, genetics, high stress, previous emotional trauma, insufficient exercise, poor diet, and certain medications. 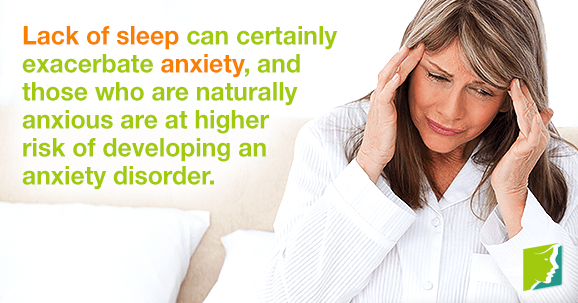 Lack of sleep can make you more susceptible to anxiety or other illnesses. Researchers at University of California - Berkeley have found that sleep deprivation increases anticipatory anxiety by firing up the regions of the brain associated with emotional processing, the amygdala and insular cortex. The researchers showed the subjects neutral and disturbing pictures after a good night's sleep, as well as after a sleepless night. After a night of rest, the participant's anticipatory anxiety levels were relatively normal. After the sleepless night, the participant's anticipatory anxiety levels skyrocketed when researchers informed them they were about to see disturbing images. The resulting patterns were very similar to the brain activity seen in anxiety disorders. Their research also showed that people who are naturally more anxious are more susceptible to developing an anxiety disorder triggered by lack of sleep. Sleep therapy is the most viable treatment option for anxiety induced by insufficient sleep. Restoring good sleeping habits is key for those suffering from lack of sleep. Exercising regularly has also been shown to help improve sleep. Relaxation methods like yoga, meditation, reading, and taking a bath with soothing essential oils are all helpful things to do before bed. It is also recommended to turn off all screens - TVs, computers, and phones - before bed because the light stimulates the eyes, making it harder to fall asleep. The studies conducted by UC Berkeley scientists showed how important sleep is to mental health. Lack of sleep can certainly amplify anxiety, and those who are naturally anxious are at higher risk of developing an anxiety disorder from insufficient sleep. Exercising regularly and trying relaxation methods like yoga and reading before bed can help improve quality of sleep.